There is a lot I could say on this topic. I’m planning a special video on it in addition to the text of the book. 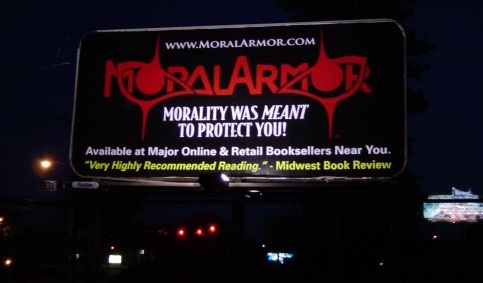 Given Moral Armor was released in 2004, the specific forms of evil have changed a bit, but the enemy is the same. The great value of my work (if I do say so myself) is that it shows there is a pattern to evil, just as there is a pattern to good. Once again, as we watch those protesting American social order, I see the same patterns in action. Once this awareness goes mainstream (with responsible people), the result should be downright explosive, and very positive. The Present Conflict in Morality. Just about every premise preached to Man under the guise of morality is wrong; often the exact opposite is true. Discovering this has not made my life any easier. When morality is inverted, it is the honest, the clean, the just and the rational that is considered controversial. When you have corrected this inversion of principles, you are speaking another language; even your physiological responses invert. As the language of good and evil has only two sides, those in the confused majority will classify you improperly and they will make you pay. There are so many fragile egos in the world, you’ll feel like a bull in a china shop. A radiant spiritual health can appear frightening at times, and will become the rift between friends who are not brave enough to break from their conditioning. In my life, I watched them peel off in layers of honesty, and I could tell who would fall next, but it’s just as well. They couldn’t soar being chained to the ground. I’m free of the Fear-driven psychologically, but societal interaction is unavoidable. And as they certainly haven’t changed, the game goes on. I’m tired of being used; I’m tired of being considered the bad apple for being honest; I’m tired of being called ruthless and mean when standing for justice; I’m tired of being called arrogant for showing confidence; I’m sick of being called lucky for expending effort. We work and we work, hoping to see our lives develop into a logical whole, and every time we reach a sense of mature significance about it all, there is something or someone out there to undercut it. Notice the hostile silence of others when you do well, and the mocking compassion when you don’t. Notice their veiled fraud of a smile in false approval of any accomplishment. Do anything too spectacular and you’re treated like an outsider; but often, their companionship is worse. I’m tired of watching people avoid purpose and self-responsibility. Stagnation is always their noble sacrifice to their kids or their spouse, where any alternate path would (of course) have led to an achievement to match or exceed ours. Such excuses allow them to abandon the subject of purpose, squidding out in relief, to return to the safety of their shallow domain. I’m sick and tired of talking about little things. I’m tired of the inspirationally lethargic ignoring everything that matters. I’m sick of their attempts to delude us into giving up, slowing down and selling out. What fun is there in playing it safe? The Fear-driven are moving towards an epitaph of “Should’ve, would’ve, could’ve.” Ours will say “Did.” I’m tired of seeing no one speak up to defend themselves or any of us against any injustice. Sometimes they vent about valid issues, but lose all backbone when facing their opposition; failing life and failing themselves. They damn the evils openly; they do understand. They can gage by rational standards when they’re treated unfairly by a boss or a spouse, but nevertheless, they cave in and carry the burdens of moral default without protest. Then they actually reverse their moral response by condemning those who refuse to suffer the consequences of giving up along with them. Staring into the void of their basic cognitive unwillingness, you can explain until you are blue in the face, but they won’t get it. They’ll make sure they won’t. Stand for anything and the first wave of fools will resent you; not on the issue, but for the capacity to stand. They turn against the fighters for truth, and in so doing, turn against themselves. They recognize the rat and nourish it anyway. At work, they cower under their bosses irrationality, and instead of wishing to correct the nonsense, they fantasize of taking over to impose their own irrationality on their subordinates. Powerless to fulfill this dream, they go home and impose it on their family. I’m tired of life in the muck. Why should it be muck? Why is it so exasperating and so difficult to get out of? What keeps us stuck at this moral level? If our enemies were all fire and brimstone they would be easy to see; but they’re not so obvious. The battle hasn’t been a swift, clean, violent clash, but a lethargic, smothering goo-offensive. Their Predation of Innocence. A child stares with wide-eyed wonder at the gigantic industries of Man: the huge vehicles, the rigs and trains that like a bloodstream, supply life to the nation. Watching his father in operation of this wonderfully complex machinery, he thinks, “Wow, my father is a giant.” The man makes his living and is seen by innocent eyes as a hero. Then the child hears unsettling lessons that tell him that his father’s role is predatory, that his making of money is vicious and that his creations are destruction. Nothing the boy can witness in his father’s bearing suggests any malevolent intention. He sees only an active, able figure, intent on its task. Even if the work is dangerous, he feels an immense exhilaration, and strangely, safety. His actual response to evil—that sense of arresting fear—more appropriately describes the feelings he has for such teachers. Confused he remains silent, but inwardly he knows something is out of line. Whether his father is a fisherman, a foreman or an executive, he isn’t thinking of destroying the world, of cheating or harming anyone. He’s thinking about the Visa bill that was due yesterday, or the overtime he needs in order to buy that bicycle for his son’s birthday which he didn’t budget for. He, like the rest of us, is keeping his family afloat and trying to make life comfortable in the process, and that’s it. We are not evil. Often, life is too perplexing for us to consider having any motives at all, beyond earning a decent living and being able to enjoy it. We spend the majority of our days working, never having enough time to relax and reflect, and we get to find out every Sunday how black our hearts are; what evils lurk beneath our surface. Hearing this, a strange uneasiness washes over; we know we don’t feel any real negativity, but we also know that we are supposed to just listen and accept. Too emotionally exhausted to consider making an issue of it and sensing no reward if victorious anyway, that is what we do. It is a big mistake: beyond that controversy lies the most critical values of living. If we’re brave enough to make a query, we’ll hear something like, “A question reveals a doubt. You don’t doubt your Savior, do you?” Stammering, we respond, “Well, no.” Unarmed and uncertain, we feel safer to remain anonymous on the subject, fearing that a less than perfect understanding would reveal a moral flaw. But we would not fear condemnation for an honest question or error if its antithesis were not protected—appreciation and reward for maintaining a pretense, such as irrational perfection. Mankind would come out of hiding from moral judgment if an unquestionable, unaccountable force was not held to rule morality; if objective values were considered moral, such as the furtherance of his life; if he had the right to defend himself and to see morality as an issue of defense; if he were free to love the things he loves, and free to investigate their cause; if righteousness was not preached as an impossibility to hopelessly strive for; if he felt safe in seeking answers for his confusion. It would be a different world for all of us if actual virtues were rewarded as we grew up. The dynamic motion of youth, fearlessly speeding along to their dreams could be all around us, as would be the marvels of their creation. But until recent history, the professionals in any field have not been acknowledged as the good, but damned as exploiters, highway robbers and fools. Nothing breeds hesitation in us quicker than watching our idols fall, physically and morally. Witnessing their hardships does not encourage youth or anyone else to follow. The bright future of a pioneer has historically been a daunting road of sneers, ridicule, intimidation, torture and sometimes even murder. How long have we been kept from emulating or even identifying the best, and for what reasons? The struggle would be palatable if we had a clear choice of good or evil, but I look around and I see that the actual good has no explicit representation in the world. As a result, only the bravest strike out on this path, while the rest dread stepping away from the skirt. Good and evil are so intertwined in our culture that neither is independently recognizable, which of course was premeditated. This made it impossible to define guilt rationally or to refute its abusive misapplication. Everyone dreads the horrible feeling of a moral failure—the shame, the downcast eyes, the public knowledge that one has intentionally chosen the wrong—to rob, to deceive, to harm or to sponge. No one wants to be that kind of outsider. Guilt is a dreadful emotion to deserve, and very important to feel for the right reasons; but what if for the most part, we don’t deserve to feel it? This inversion has us feeling guilty for making our living, for feeling good about ourselves and for upholding rational standards. Guilt is a correctional facility in itself for those who really want to live; but it is a brutal trauma to experience if undeserved, and is a sacrilege if imposed dishonestly. When you work hard and accomplish something great, then hear you are a greedy, selfish hater of those less endowed, you should be mad. When we reach our limit of tolerance and become offended, they’ll tell us not to take it personally. I’m here to tell you, take it personally. Look at your accuser. Steady eyes will see the way.